"Its a natural assumption for people to make, however there are very, very few people who are rough sleeping at present. " - Liz Hancock, chief executive of the Harrogate Homeless Project. The growing visibility of street begging and sleeping rough in Harrogate town centre over the last year or so has caused alarm with the public - and natural sympathy. But the authorities say all is not what it seems. One person, in particular, should actually know what the situation is. Liz Hancock is chief executive of Harrogate Homeless Project, the charity which does so much on a daily basis to help support the homeless and change their lives for the better. Working closely with Harrogate Borough Council and a wide range of other local bodies, Liz Hancock is keen to counter what she says are the “myths” about begging and homelessness in the town. 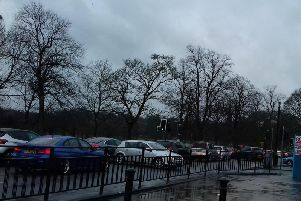 Liz Hancock said: “Begging is certainly increasing in Harrogate and it can be distressing for members of the public to see people in poverty sitting in the town centre. “For whatever reason, these are vulnerable people who need money for a variety of different reasons. “But HHP is keen to highlight that most people begging are not street homeless. Liz Hancock said: “It’s a natural assumption for people to make, however there are very, very few people who are rough sleeping at present. “Many people who beg are encouraged by the relative profits to be made, and there is an element of targeted begging, such as key locations in the town centre, key times of day including targeting the night time economy. She continued: “HHP would certainly not judge or condemn people who feel their only option is to sit in the street begging. However it’s a saddening misrepresentation of genuine street homelessness. “It is a personal choice whether to give money to individuals on the street, however we would not condone this. “Very often it actually maintains street lifestyles and supports addictions, preventing people from accessing a life away from the streets. “We closely monitor individuals on the streets, including street begging, attempting to engage with people through our day service – which provides free lunches, showers, laundry facilities and support services. “Through this engagement we encourage people to enter our resettlement scheme and begin to address their support needs. “Access to our emergency accommodation is free . “Similarly people are told that they can’t access benefits because they have no address, yet we are able to support people with their claims at our day service and offer a care-of address.